Location: Dortan, in the Ain departement of France (Rhone-Alpes Region). Notes: Château de Dortan is a mansion of the fifteenth - sixteenth century, rebuilt in the eighteenth century and restored in the nineteenth century, the center of the Lordship of Dortan, which stands on the town of Dortan in the Ain department in Auvergne region-Rhône Alps. He succeeds former most likely higher castle in the twelfth century. 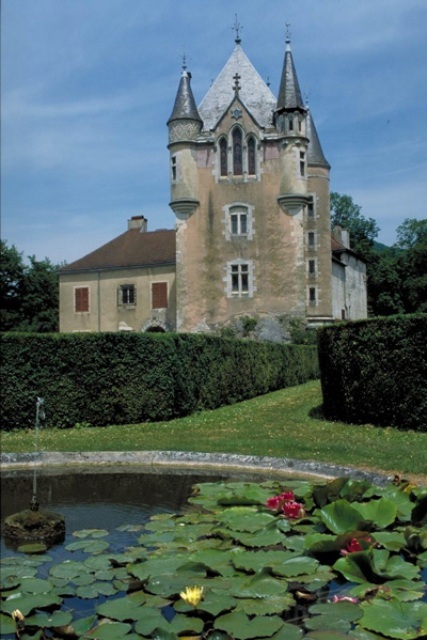 Because of its location the castle had to undergo numerous attacks including that of Richelieu's troops in 1637. The castle including its underground parts, with the western esplanade and garden terrace on the south, the park and its surrounding wall, the common building and windmill pump are the subject of a registration as monuments historic by order of 12 December 1997.